Incredible view and spectacular moon rise! Thank you for a most delicious breakfast. Thank you Irina for your lovely hospitality, beautiful roses and great breakfast. The view is spectacular. Thank you for making us feel so at home here It was lovely. The bed was amazing. Food fabulous! The view was amazing it was fantastic sitting in the hot tub looking over the trees. Glad we stayed here. My 88 years aunt said she felt like the Queen of Sheba! The breakfast was great! Great view and peaceful place. Beautiful stars at night. Wonderful breakfast. We will remember YOU!!! Back a second time- and hope come again Thank you for lovely stay. Thank you for your hospitality. Cozy room and beautiful view. Breakfast was great. 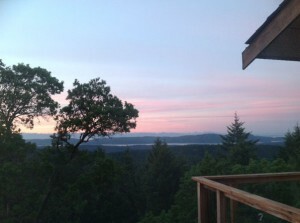 We are very excited to get married on Salt Spring Island in September. Thanks again. A perfect spot for a romantic getaway. Fantastic view, wonderful breakfast, delicious each time; and most gracious host. Thank you Irina, for helping make this an unforgettable weekend, one we will talk about for a long time to come. Beautiful place to stay. I love being spoiled! Best kind of holiday. Neat. SOOO many wonderful home cooked.Spesciakines to choose from of course mine were the best ever! I decided to take a picture of the roses with the best scent. Well would you know it, the camera is full! That gardens are a delight for the eyes and the nose. I think it would be a good idea if I packed our hostess up and took her home with me! Spectacular views to relax the busy mind. Phenomenal weather. Scrumptious Vacation was we ordered and exactly what we got. Thank you for everything. You are on our “ must do again “ list. Amazing food and flowers! We got engaged on Mount Maxwell yesterday morning. Beautiful place to stay no matter what the occasion. Thanks so much! Thank you for your warm and gracious hospitality. Best B&B we have experienced yet! How lucky I was to win a night here at your place. IT was fantastic. Thanks! Ребята! Было все здорово!Мы приедем как-нибудь ещё раз на Иринины блинчики. Чувствовали мы себя как дома. Даже не соскучились и не хотим возвращаться к себе. A beautiful view, incredible hot tub and having a Russian breakfast was a real treat! Thanks. WOW!!! Look at the view!! A very nice place. We‘ll be back!! Thank you for many beautiful nights. Thanks for a great stay. Breakfasts were Awesome!!! Enjoyed the wine and the hot tub!! Marvelous BED!!! Amazing Russian Crepes!!! Comfortable bed, excellent meals, friendly cute kids, wonderful view, warm mornines, star filled nights, exciting drives, a holy cow look at all movies. Thank you for a pleasurable time. Unfortunately, we had a lot of rain, but luckily this place is located above the clouds so we were able to enjoy it! Thank you very much Irina and Juergen for making our 10th Anniversary very special. We had a wonderful time especially sharing a barbecue with your family. Thank you for the wonderful stay, the breakfast and the room is very romantic and made our anniversary extra special. Irina you are a wonderful person with such a big heart and I thank you for all the effort you made to make our stay extra special. You are both such wonderful people. Today is our wedding day! We are so blessing to have been able to spent the night here! The view upon waking is breathtaking and all the flowers are gorgeous! Absolutely amazing view. Best sleep ever. Wonderful breakfast and fabulous service. Thank you! A wonderful stay in an enchanting B&B We loved the view, the food and our gracious host Irina. We will return so keep the hot tub going! We would like to thank our hosts for the magical weekend we spent at their B & B this summer, Aug 2012. Our room was delightful and the bed was so amazing you really don’t want to get up! The little touches like real crystal, feather beds, desert delivered to our room each day and the home made peppermint tea from Irena’s garden made us feel so welcome, not to mention the delicious breakfasts each morning. The view was spectacular and the whole experience was so relaxing, I would certainly insist people come to this B & B it was truly delightful. Thank you, Irina , for a lovely stay at your B&B Our rooms (Red Cedar Suite and Pine ) were both very comfortale and quit.Best of all was the deck from which we had an incredible panorama of forests,mountains and water.The weather being exceptionaly beautiful,we could even see the lights of Vaucover in the distance,at night.And what silence!I almost forgot to mention the delicious homecooked breakfast,the Russian pancakes(so much like our French ones) and the home made jams – yummy!In the past,we had our wedding anniversary in many lovly places-Paris,the south France,Austria,Orvieto and Verona in Italy-but this one,inSalt Spring Island,will remain,I am sure,one of the most beautiful,peaceful and memorable. Spacibo,” thank you and merci encore, Kendal and Steve 2011. We are so lucky stay at Armand Heights B&B . It was wonderfull hospitality .Our breakfast were beyond expectation and the veiw was breathtaking.The serenity is priceless.Katya is a real gem and will be a wonderful hostes in the future.I want to said many thankx to Irina for taking care about us. We will be back. Hi Irina, Thank you so much for your hospitality. Our family really enjoyed the stay at your b&b and would strong recommend it to our friends. We had a relaxing and wonderful stay at your b&b. The place is very clean and cozy, the breakfast are well-presented and yummy, the view is spectacular. Overall our family had an excellent and very postive experience at you b&b. Aug long weekend. Thank you for the wonderful rest and hospitality. You are very genuine and honest people and our campfire discussions not only challenged us, but also gave us a fresh view. Thank you for bieng so warm and kind and helpful, Irina and Juergen. All the best for you and your family. What a wonderful place you have. Thank you for making us feel so welcome. Our only regret…our stay was too short. Thank you very much for your wonderful hospitality and generosity. I will definitely come back if I ever get the opportunity.